Poorly defined details and a low percentage of silver reveal that this isn’t a genuine coin. 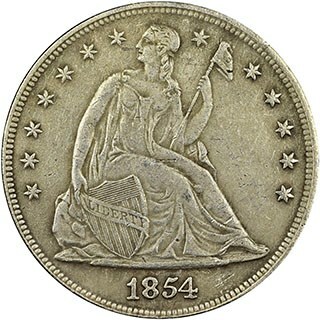 The Seated Liberty Dollar is a popular coin with collectors, but they can be quite expensive. These high prices are due to the series’ overall scarcity. To put it into perspective, the highest reported mintage for a single Morgan Dollar is the 1921 Philadelphia issue, with some 44.69 million pieces struck. 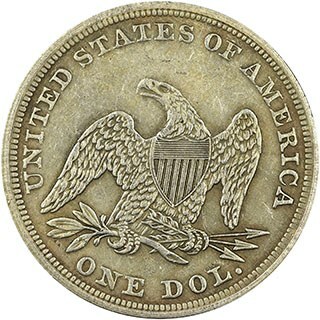 Compare that to the mintage of the entire Seated Liberty Dollar series of only about 6.5 million coins, and you see the issue. Even though less people collect Seated Liberty Dollars, their prices still reflect that overall lack of supply. Recently, NGC received a semi-key date Seated Liberty Dollar for grading that likely would have been worth thousands of dollars if real, but unfortunately for the submitter, it was not genuine. 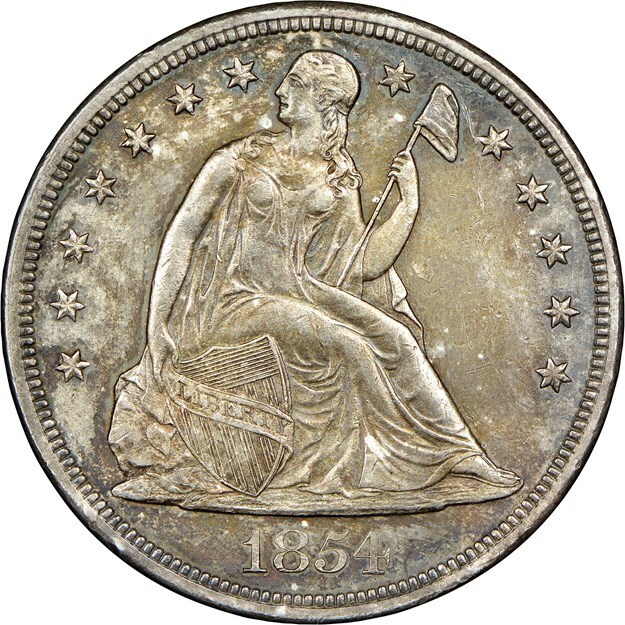 This 1854 Seated Liberty Dollar has the typical look of a cheaply produced counterfeit. The details are mushy and rounded, and the denticles are poorly defined in many areas. In addition to that, the coin is not predominantly silver. Although it is the correct weight, it is not struck in 90% silver, 10% copper as it should be. Instead, the coin is an odd mix of 65% copper, 29% Zinc, 5% Nickel, and 1% Silver. 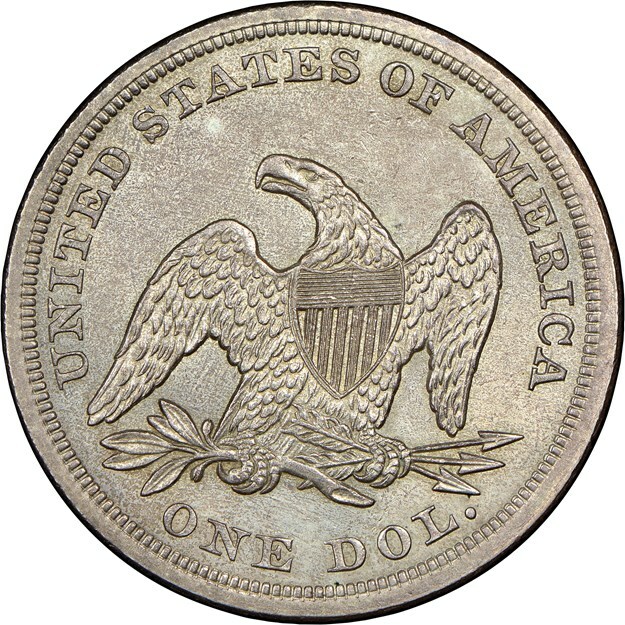 This has given the coin a very unnatural color that would not normally be found on a genuine US Mint coin struck in the correct composition. As you can see from the photos of the genuine example above, a real example of an 1854 Seated Liberty Dollar looks far superior to the counterfeit. Notice how sharply defined all the details are. Pay especially close attention to the shallower parts of the design. For example, the fine detail within the folds of Liberty’s robe or the feather detail on the eagle. Both have lost much definition from genuine to counterfeit. 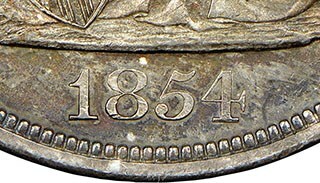 The date, denticles and rim are also much better defined on the genuine coin, which is evident in the photos above. 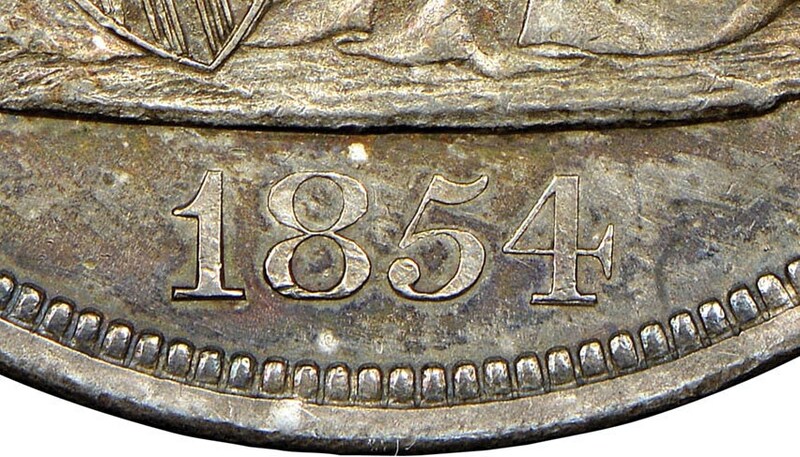 Look at how sharp and squared off the date is on the genuine coin, whereas it is rounded and lumpy on the fake. 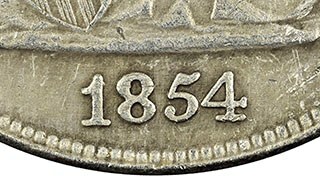 Additionally, the date appears to have been added later on the fake; it should appear more as a part of the fabric of the coin. The photos also accentuate the lack of detail in the denticles, which are fading into the field on the fake. Lastly, the rim is much rounder and narrower on the counterfeit, likely due to insufficient striking pressure or simply poor details on the dies. While this particular fake was not terribly convincing, it’s clear that it slipped by at least one collector. In numismatics, one must always remain vigilant, as counterfeits are becoming increasingly commonplace. Of course, the expert graders have spent years honing their skills authenticating coins. Therefore, if you are unsure of your authentication abilities, it is best to leave it to the expert graders, as every coin graded and encapsulated by NGC is guaranteed to be authentic.